The location of the Acton Historic Site— smallest state park in Texas. 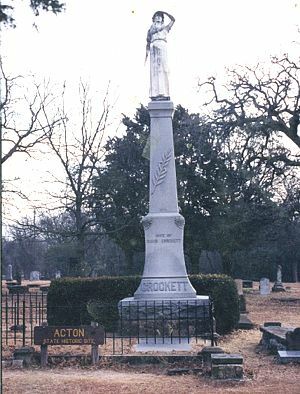 Includes the grave of Mrs. Elizabeth P. Crockett (1788-1860), widow of the Alamo hero, David Crockett, and mother of two of his children. In 1911, a monument and statue were erected to her memory. Acton, (formerly Comanche Peak Post Office) was named in 1855 by C.P. Hollis, first merchant in town. In spite of early name, Acton had few Comanche raids. After erecting a building for church and school, area pioneers selected this plot as their cemetery. First person buried here was Mrs. Wash Hutcheson, in 1855.